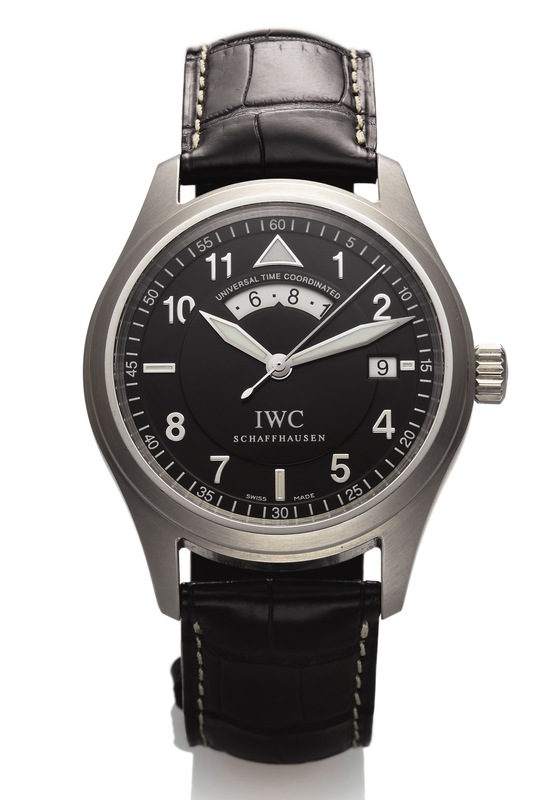 IWC REF. 3251 UTC PILOT STEEL International Watch Co., Schaffhausen, "Die Fliegeruhr - Universal Time Coordinated," case No. 2956123, Ref. 3251. Made circa 2010. Fine, two-time zone, center seconds, self-winding, water- resistant, stainless steel wristwatch with date and a stainless steel IWC buckle. Accompanied by the original fitted box and booklet. Two-body, polished and brushed, screwed-down case back and winding crown, soft iron antimagnetic shield, concave lugs, concave bezel, domed sapphire crystal. Black with applied Arabic numerals, luminous baton and triangular indexes, apertures for the date and the Time Zone Corrector (TZC) in 24 hours, outer minute track. Luminous steel lozenge hands. Cal. C 37526, gilt brass, oeil-de-perdrix decoration, 21 jewels, straight-line lever escapement, monometallic balance adjusted to 5 positions, shock absorber, self-compensating flat balance spring. C. Two-body, polished and brushed, screwed-down case back and winding crown, soft iron antimagnetic shield, concave lugs, concave bezel, domed sapphire crystal. D. Black with applied Arabic numerals, luminous baton and triangular indexes, apertures for the date and the Time Zone Corrector (TZC) in 24 hours, outer minute track. Luminous steel lozenge hands. M. Cal. C 37526, gilt brass, oeil-de-perdrix decoration, 21 jewels, straight-line lever escapement, monometallic balance adjusted to 5 positions, shock absorber, self-compensating flat balance spring. Dial, case and movement signed. DIAM. 39 mm. THICKNESS 12 mm.